Epson company offers you absolutely new and efficient multifunction printer Epson wf-2010w, which is ideal for small offices working. This model allows printing of color documents and photos of high quality and printing speed up to 38 pages per minute. Moreover, device solves problem of high-speed ink consumption. Owing to its compact size and embedded Wi-Fi module, you can set it at any appropriate place you want. Given printer can perform quality document printing of different format, starting from A6 and up to A4 format. Images' max resolution is 5760x1440 dpi. Printing speed is 38 pages per minute for A4 format and is the same in both cases on monochrome and color mode respectively. This characteristic feature is a significant competitive advantage. Epson wf-2010w gives the possibility of painting on envelopes, on glossy, matt or photo paper. We should mention that among main advantages of this model is photo paper printing ability, because, by no means all of this line's models have such advantage. Saving printing is one more additional advantage of described device. Firstly, it has four separate cartridges, each cartridge per each color and you can replace only those cartridges which have run out of ink. Secondly, you can apply extended capacity ink reservoirs for printer wf-2010w in spite of standard ink cartridges. This, in its turn helps to get 10% savings. For example, the resource of black ink cartridge with standard capacity is 175 pages, while the resource of the same cartridge, but with extended capacity is about 500 pages. Thus you can feel the difference. Just use them and you can print much more documents and photos. Moreover, quality of printing is not changing, because wf-2010w Epson is working on using of pigment quadricolor ink, referred to as Epson Durabrite Ultra. This type of ink is quickly drying one and resistant to mechanical effect, as well as to selection marker and penetration of water. 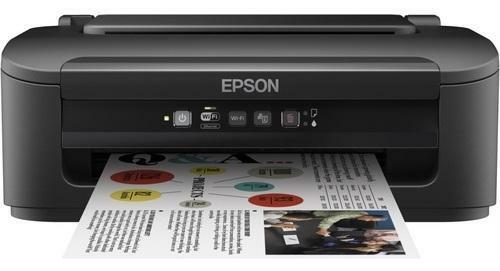 If you have a mind to buy similar model, which has functions of scanning and copying, then we suggest you to turn your attention to Epson Stylus Office TX600FW. Printer of this model is rather compact in size and weight. Owing to these characteristics it can be set on any working place. Matt surface package and stylish design make it to be blend with any interior. There is an opportunity of All-in-one printer Epson wf-2010w connecting via Wi-Fi. This function makes the given device much more adaptable and practicable in use and placement. You can connect several PCs at once by means of this wireless connection. And this is very important advantage for device aimed to be used for office work. Besides mentioned above, our device is provided with Ethernet interface, which is very important too. Our device turns to be an excellent assistant at office work as well as home working. Epson printer wf-2010w is an easy-to-use device, which makes it to be used by schoolchildren and students to print reports, condensations and other documents easily and quickly. At long last, presented device is inexpensive, compact, and useable and which is the most important, high quality MFD. It is ideal for home and small office use and is able to fall in with any interior in a compact and stylish manner. Epson Workforce WF-2010W owing to its technical capacity is able to meet all the challenges with a bang! If you want to make a comparison, then we would like to recommend you more powerful MFD, named as Epson WorkForce WF-3010DW.